The Vivo X21 officially launches in the Philippines. The handset features an in-display fingerprint scanner, dual rear cameras, Snapdragon 660. 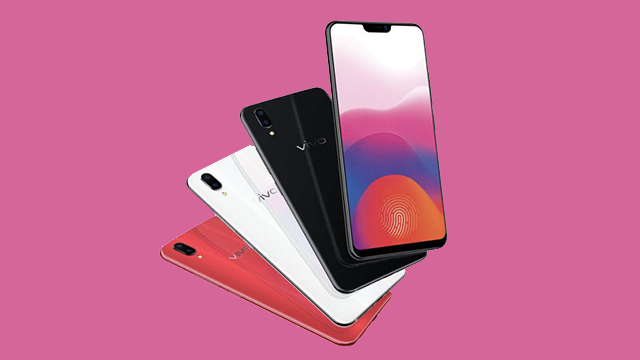 The Vivo X21 is now official in the Philippines. The handset initially launched in China last May. The X21 is headlined by an in-display fingerprint scanner that allows users to unlock the phone through the display. The technology relies on OLED screens that lets the sensor peek in between the pixels to identify unique fingerprints. As for its specifications, the X21 features a 6.28-inch Super AMOLED display with a 90.3% screen-to-body ratio, an octa-core Qualcomm Snapdragon 660 chipset, an Adreno 512 graphics unit, 6GB of RAM, and 128GB expandable storage. The handset comes with a 12MP (f/1.8) + 5MP (f/2.4) dual rear cameras, and a 12MP front shooter with an f/2.0 lens and an IR fill light that allows for a fast Face Wake 2.0 mapping. The Vivo X21 is priced at PHP29,999. It will be available starting June 22, 2018 in selected stores across the Philippines.